So, it has been 12 years since The Red Shoes appeared in our shops. Why the wait? Kate Bush is on record as saying she is frustrated that people consider her to be a reclusive weirdo, when in fact all she has been doing over the last 12 years is enjoying a normal family life - and of course writing songs. So perhaps the question should be, is Aerial worth the wait? Aerial is split into two discs, the first a collection of songs entitled A Sea Of Honey, the second a concept piece called A Sky Of Honey. Beginning with the single, the slow-burn King Of The Mountain - perhaps not the strongest track, yet the only one capable of kicking off this album - the next track, Pi, is a gem, an evocation of a mathematical genius calculating pi, set to a keyboard sound like that of The Who's We Won't Get Fooled Again. A marvellous double bass accentuates the music. Every time I hear this track I am reassured that Kate Bush hasn't lost an iota of her talent. Bertiefollows, with its Renaissance-style arrangement, and while I can appreciate the sentiment of a mother observing her son, even Kate Bush can't struggle free of a certain mawkishness. Many of the early media comments about this album focussed on Kate Bush's domesticity, and in particular on a song devoted to her washing machine featuring the lyrics "Slooshy sloshy slooshy sloshy/ Get that dirty shirty clean..." I suspect that this song, Mrs Bartolozzi, has a far profounder significance for its writer than for us, since it is emotionally charged, elegiac and haunting, evoking songs and sounds from the 1980 album Never For Ever - a work it would have fitted perfectly. Images of the sea intertwine with domesticity and the cleaning of clothes, but the overall tenor is one of grief following loss, and while the lyrics above do appear whimsical, the way they are recorded and arranged gives them an unmistakeable quality of sorrow. This is another gem. Two more mid-paced songs follow, both of them involving, albeit mildly orchestrated, and then it is time for A Coral Room, a song about the death of Kate Bush's mother, Hannah. Simple and evocative, with a wonderful vocal, its themes intertwine with an understated piano accompaniment. A spine-tingling male vocal - over in a few seconds - is a typical stroke of Bush genius. The mood of this first CD is reflective, concerned, so it seems, with themes of loss and of ordinary life. The arrangements are simple, even sparse, but the songs are better for this. Gone are the 1980s' style drums, the relentless rhythms, and almost all of the chorused vocals and multi-tracked voices. On its own this would have been a terrific release. I was worried that Kate Bush would produce another Red Shoes - perhaps her weakest album - but she has moved on into middle age with grace and a touch of magic. The second collection of songs forms a concept album exploring a painting trip that covers the space of one day. This CD shows just what a prodigious talent Kate Bush is, recalling the heady days of The Ninth Wave, which is to this day my favourite piece of her work. Birdsong and voices intertwine with the first two (again elegiac) songs, before we are into the slow dance of An Architect's Dream, which recalls some of the feel of Hounds Of Love. Then Rolf Harris turns up. Early media comments focussed on this appearance as wince-inducing, but I have to say that his brief vocals - one spoken, the other sung - fit perfectly into the music, and are far from irritating. Rolf Harris has of course featured on Kate Bush's work before, playing didgeridoo on The Dreaming, so his appearance should not be a surprise. 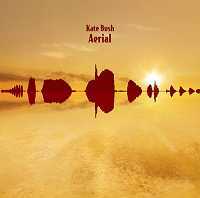 A rolling piano takes us into Sunset, and then the birds return, and another stroke of magic - Kate Bush singing along with various fragments of birdsong. Somewhere In Between is a faster paced affair with a jazzy feel and a delicate vocal. The final two tracks, both lengthy, conclude the album in what seem by comparison upbeat moods, though they are not of themselves upbeat. Images of sea and sky dominate the lyrics, and Gary Brooker's Hammond organ is effectively used. A final touch of Bush-esque eccentricity - the laughter of what seems to be a madwoman - help conclude the CD in bizarre fashion. Apparently, domestic duties made the recording of Aerial a disjointed process, but any listener unacquainted with this fact would not guess. Lyrically and musically all is linked, within the two albums themselves, and between them. Fans of Kate Bush hoping for another Hounds Of Love will be disappointed. But this wonderful album shows that Bush is an artist who moves on, who writes for herself, hoping - perhaps assuming - that her fans will follow her. Anybody happy to sit down and listen to these songs will find much to ponder.